If the convenience factor has been what’s stopping you from donating your gently-used clothes, shoes, books, and toys, I’ve got good news for you! You can now wrap those suckers up in the Amazon boxes that flooded your doorstep over the holidays and ship them to Goodwill…for free! Confession: Holiday gifts kind of stress me out. My family lives in a small house, so any time we receive a big gift, we have to figure out where to put it. Usually, that means getting rid of something to make room for this new something. If you’re like us, the Give Back Box program is perfect for you! Instead of tossing your old boxes into the recycle bin, you can put donations inside and print a free shipping label to send them to Goodwill for resale. Once you’ve packed up your goodies, go here to print your free shipping label. You can drop it at a post office or UPS store or opt to have them pick it up from your doorstep. If you don’t have a printer, just bring your packed box to the UPS store – they’ll print the label for you for free. I love this idea from a low-bar-to-entry angle, but I am not crazy about Goodwill as an organization. Yes, they keep goods out of the landfill and provide employment for disabled workers, but an NBC investigation uncovered some serious corruption in the organization that is hard to ignore. Those workers they hire often work for pennies an hour, because of a loophole in the law. 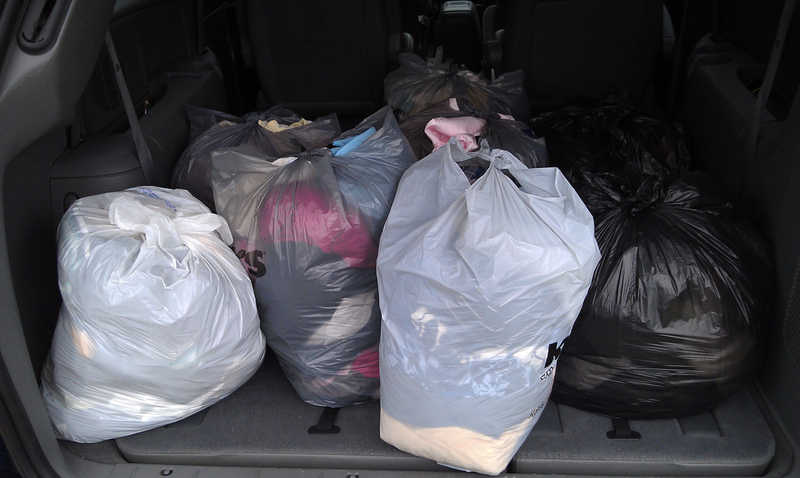 Even better, though, is donating those goods to local mom and pop thrifts that support local charities. Here in the Atlanta area, for example, you can donate to Second Life, a thrift store that supports a local animal shelter. Local women’s shelters can often use clothing, shoes, books, and toys, and not just items for adult women. Women fleeing domestic violence often have children in tow. If your options are throwing things away or using the Give Back Box, I say go for it, but if it’s possible to give to a local organization, your donations will have an even greater impact.